Central Park in New York City (looking south, from the middle of the park, to the Empire State Building, at top). Central Park in the central area of Manhattan (right-click each picture to enlarge). The borders are 59th to 110th Street, Eighth Avenue and Fifth Ave. (south, north, west, east). Central Park is a large public park in Manhattan in New York City. Central Park has about 35,000,000 visitors every year. It is the most visited city park in the United States. The park contains lakes, a castle, the Metropolitan Museum of Art, and the Central Park Zoo. The park has been shown in many movies and television programs. The park is 2.5 miles (4 km) long between 59th Street (Central Park South) and 110th Street (Central Park North), and is 0.5 miles (0.8 km) wide between Fifth Avenue and Central Park West. It is similar in size to San Francisco's Golden Gate Park, Chicago's Lincoln Park, Vancouver's Stanley Park, or Munich's Englischer Garten. It lies between the New York Theater District, Harlem (north), Upper West Side, and the Upper East Side. Central Park is bordered on the north by West 110th Street, on the south by West 59th Street, on the west by Eighth Avenue, and on the east by Fifth Avenue. Along the park's borders however, these are known as Central Park North, Central Park South, and Central Park West, respectively. Only Fifth Avenue retains its name as the eastern border of the park. Each of the twenty gates on these streets has a name. The park is bigger than Monaco and Vatican City, though some other parks in the city are even larger. In 1855, New York City had four times as many people as in 1821. The city grew bigger, and there were fewer parks in Lower Manhattan. A park was being planned for Upper Manhattan. Two years before, in 1853, the New York state government gave over an 700-acre (280 ha) area, from 59th to 106th Streets, to build the Park. The land alone cost more than US$5 million. The park first opened in 1857. In 1858, Frederick Law Olmsted and Calvert Vaux won a design competition to improve and expand the park with a plan they entitled the Greensward Plan. Construction began in the same year and was finished in 1873. Many rocks, soil, and plants were put in the park. People living in the park were forced to move out. Later, the park was made larger. In the 1930s, because people hadn't taken care of the park, it was cleaned up and changed by Robert Moses. By the 1960s, the park became a bad place to go again, so in the 1980s and 1990s, the Central Park Conservancy was made. The Central Park Conservancy cleaned up Central Park from the 1980s through the 2000s. The park was named a National Historic Landmark in 1963. The Central Park Conservancy runs the park. They operate it because of an agreement with the city government. 85% of Central Park's $25 million annual budget and 80% of the park's maintenance staff come from the Conservancy. The conservancy cares for 250 acres of lawns, 21,500 trees, 150 acres of lakes and streams, and 130 acres of woodlands. Their staff plant hundreds of bulbs, shrubs, flowers, and trees every year. They make sure that 9,000 benches, 26 ballfields, and 21 playgrounds are clean and good to use. They also care for 55 sculptures and monuments, as well as 36 bridges. Conservancy crews remove graffiti from Central Park and collect more than 2,000 tons of trash a year! The Conservancy has been led by four presidents. The first is Elizabeth Barlow Rogers, who helped to create the Conservancy in 1978. She was president until 1996. Karen H. Putnam, the Conservancy’s development director, was president from 1996 to 2000, after completing the projects slated under the Wonder of New York capital campaign. The third, Regina S. Peruggi, used to be president of Marymount Manhattan College. She led the Conservancy from 2000 to 2003. Since 2003, Douglas Blonsky, who used to look over construction for the Park, has been the president of the Conservancy. 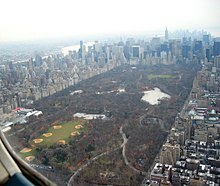 Central Park has been mentioned in thousands of books, movies, and TV shows. In the U.S. TV show Friends (1994-2004), the coffee shop where the characters often gathered was named "Central Perk" as a pun on the term "coffee percolator" (a type of pot used to brew coffee). ↑ "America's Most Visited City Parks" (PDF). The Trust for Public Land. June 2006. Retrieved 2006-07-11. ↑ "Things to do in Central Park". ↑ "Central Park Visitor's Guide". AM New York Interactive. ↑ Todd, John Emerson Todd (1982). Frederick Law Olmsted (see the history of Green-Wood Cemetery). Boston: Twayne Publishers: Twayne's World Leader Series. p. 73. ↑ "The Great Park Debate - 1850". CentralParkHistory.com. Retrieved October 20, 2014. ↑ "Taking the Land - 1850". CentralParkHistory.com. Retrieved October 20, 2014. ↑ Andrew S. Dolkart. "The Architecture and Development of New York City". Retrieved October 20, 2014. ↑ Rosenzweig, Roy; Blackmar, Elizabeth (1992). The Park and the People: A History of Central Park. p. 150. ↑ "The History of Central Park". Sarah Waxman. Retrieved October 20, 2014. ↑ "Robert Moses and a New Deal". Centralparkhistory.com. Retrieved October 20, 2014. ↑ "The History of Central Park". Centralparknyc.org. August 18, 2009. Retrieved December 20, 2012. ↑ Nurturing the People Who Help Central Park. Joseph Berger, The New York Times, November 11, 2004. This page was last changed on 17 December 2018, at 13:48.